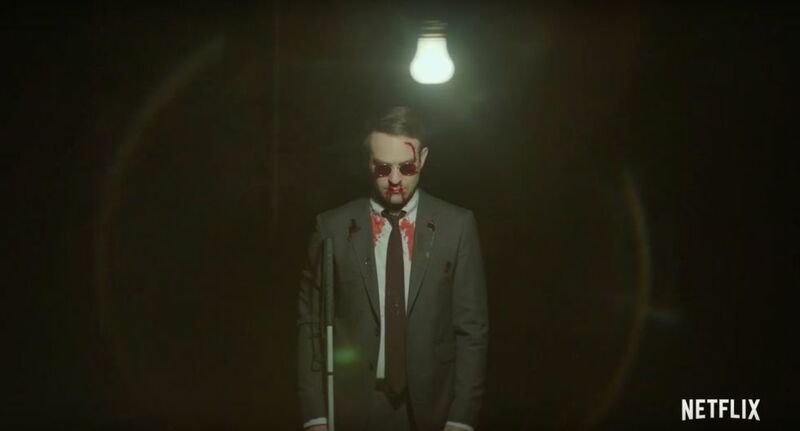 While the Netflix Marvel Universe has been on somewhat of a downward spiral recently, culminating in the cancellation of Iron Fist and Luke Cage, the third season of Daredevil is a welcome return to form for a hero that is easily one of the most engaging and well-rounded heroes in both television and film. It’s actually quite shocking Daredevil is as good as it is when compared to the other Netflix superhero shows (excluding Jessica Jones season 1 which was fantastic for the most part) most of which are fine, but largely forgettable. It would be easy to look upon Marvel’s Netflix shows as an example of brand over-saturation, which they arguably are. Yet, Daredevil stands high above the rest. Debuting as the first of four shows, plus a Defenders crossover, in 2015, the arrival of Daredevil (not the Ben Affleck one) changed superhero television. Slick, dark, edgy, with more quality choreographed fight scenes than you could shake a white cane at, the show rightly garnered much praise and admiration for his neo-noir crime structure, that didn’t feel shackled to the ever-expansive Marvel Cinematic Movie Universe. In fact, his first solo outing was so successful that Netflix fast-tracked a second season that debuted before The Defenders. However, after that second season, which released to largely positive reviews, the Marvel Netflix universe began to stagger. The first season of Luke Cage was good, until they decided to kill the most interesting character on the show; Iron Fist was pretty much an all round train-wreck that felt like it was laying so much ground for The Defenders, it didn’t have enough time to focus on its own story. Then The Defenders released in July of 2017 to the sound of zero applause. It was universally recognised that the show had squandered its Avengers-like opportunity to assemble its heroes in a crowd pleasing way, and the show came and went without much attention. 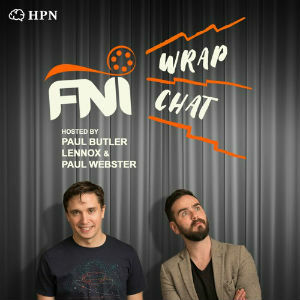 Since then we’ve had The Punisher, which was solid, we’ve had the second season of Jessica Jones, the worst of all the shows (Iron Fist included), the second season of Luke Cage which was better than the first, and the second outing of Finn Jones’ Iron Fist which was similarly was a vast improvement on the first season, but that’s not saying much. This brings us nicely up to date with the current state of play, and the return of The Man Without Fear. Daredevil Season 3 begins in the aftermath of The Defenders, where Matt miraculously survives the collapse of the building at Midland Circle. He is rescued and cared for under the watchful eye of Sister Maggie Grace (newcomer Joanne Whalley). Matt’s spirit, much like his body, is broken from his circumstances and he begins to question the nature of his faith. Despite the imagery of a Christ-like Matt with arms outstretched escaping from the collapse, the man who awakens is not spiritually reborn in any way. Instead, Matt evokes the biblical story of Job, the righteous servant of God who had everything taken from him in an exercise of faith. Instead of affirming his faith in God, Matt abandons his faith altogether, as well as the identity of Matt Murdock. 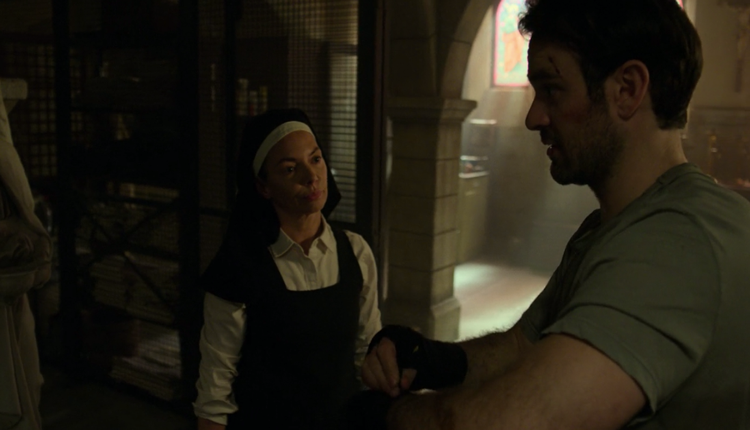 In a powerful scene early on in the show, Matt tells Sister Maggie how he, like Job, sacrificed everything in service of a higher power, he became the righteous soldier of God, and for his servitude he was rewarded with pain, misery, and suffering. This question of faith is returned to time and time again over the course of season. Faith in God, faith in forgiveness, love, friends, justice, democracy; the idea of faith is at the heart this time around. Faith, particularly faith in God, has always been a pivotal part of the character of Matt Murdock, an Irish-American raised in the Catholic religion. His faith in God and the justice of God has been one of his key defining factors since the show began. Matt’s belief in free will and the possibility of redemption, the ability of people to change and be better has kept his character on the straight and narrow until now. This season Matt questions whether there is free will in the world at all, or are we all predestined to carry out whatever we were programmed to do: some evil, some good. Over the course of the season, we see as Matt stares deeper and deeper into the abyss, the darkness stares back at him and he seems destined to go through with the one deed he has refused to do until now. Rising from the ashes, and on a mission of his own, is returning bad guy, and all-round fantastic villain, Wilson Fisk (Vincent D’Onofrio). Arguably one of the best comic-book villains ever put to screen, he returns this season to take back control of the city he holds so dear. Joining him in the villain corner is newcomer Wilson Bethel, playing the increasing unhinged FBI agent Benjamin “Dex” Poindexter. Together they form a strong axis of evil for our hero to combat against, and oh how amazing it is to behold. It’s actually shocking how good the action scenes in Daredevil are when compared with the other Netflix shows, particularly Iron Fist which, on paper, should have the best and most visually striking action scenes of any of the characters. We all know the infamous hallway fight scenes of the first two seasons, well all I can say is that when the hallway fight happened this time, I was genuinely unprepared and by the end my mouth was on the floor, it was that impressive (Think the tracking shot from the first season of True Detective). I wonder is the Netflix action budget simply reserved for Daredevil, and the leftovers are filtered through to the remaining shows, because how else can you explain the disconnect? In conclusion, without wishing to spoil anything more, I urge everyone to go and watch this show. Even if you find yourself tired of the interconnectiveness of Marvel and all their adjacent properties, that doesn’t matter because the show doesn’t care about that either. All you need to know is that Matt is in a dark and terrible place at the beginning of the season and his friends believe him to be dead… done, now watch. The season is less costume superhero drama, and more crime thriller, which, I must say, is helped by the return of the black suit which alleviates a degree of theatricality that the daredevil costume can bring and adds a more serious edge to the proceedings. Quite possibly one of the best seasons of television in recent years, and certainly the best superhero television show currently airing. Go watch it now, lest Netflix feel the desire to wield the axe of cancellation again! Daredevil Season 3 is streaming on Netflix now.